TRENTON – Beatrice Mwariri ’06 (A.S. Nursing) found her way to Mercer County Community College in a rather unconventional way. A friend of hers got her in the car, drove her to the West Windsor campus, and dropped her off. Mwariri graduated from Mercer with highest honors, and is now a nurse practitioner at HiTops in Princeton, an organization dedicated to adolescent health. She said that day in West Windsor was the beginning of a rewarding career, and it would not have been possible without the support of family and friends. 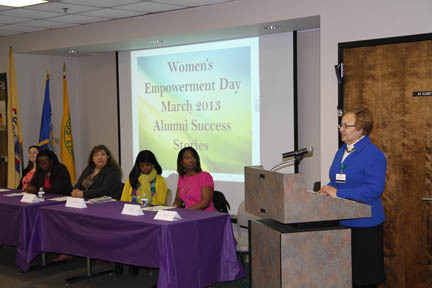 She was one of five Mercer female alumni who offered their stories as part of Women’s Empowerment Day, held March 6 at the Trenton Campus. Dr. Diane Campbell, Executive Dean for Student Affairs (right), offers opening comments during Women's Empowerment Day March 6 at the Trenton Campus. Others sharing their stories, from left, are Tina Young, Beatrice Mwarir, Leonor Tapia, Tashanna Ellis, and Sgt. Crystal James. Mwariri came to the United States from eastern Africa in 1996 seeking opportunity, but quickly realized that she needed additional education to make her dreams reality. She said it wasn’t easy juggling family obligations, working, and studying all at the same time, but the end result was worth it. “Today I have a career that I love,” Mwariri said. Leonor Tapia ’10 (A.A.S, HRIM) also had a dream of a bright future when she came to America from Ecuador 24 years ago, speaking very little English. But the only job she could get was cleaning tables, which motivated her to learn English and eventually enroll in classes at Mercer. Today, she is the bilingual community outreach coordinator for Planned Parenthood Association of the Mercer Area. The primary challenge for Tina Young ’04 (A.A. Communications), now MCCC’s events coordinator, was different – it was financial. She applied to, and was accepted, to several four-year colleges. But as it turned out, getting accepted was the easy part. “I didn’t go to any of those (colleges), because I had no idea how to get the money to go there,” she said. Young notes that many of her classmates from high school joined her at Mercer for similar reasons. She eventually graduated from Mercer, earned her degree in Education and Psychology from Rider University, and after serving as a teacher and coordinating summer camps, she landed the job at Mercer. “You really want to find out what you can put your heart into,” Young said. Sgt. Crystal James '09 (A.S. Criminal Justice-Corrections), of the Mercer County Correctional Center, had a different motivation for going back to college: she knew that corrections would be a steady career and still provide opportunities for a second career in retirement. And after 10 years of taking classes, she is ready to start teaching, and is hoping to do so drawing on her experience as a corrections officer. The story for Tashanna Ellis ’08 (Liberal Arts-Social Science) is one of overcoming seemingly insurmountable challenges, a path she describes as “from the pit to the palace.” She found herself a teenage mother without financial resources and without the skills to get a good job. Ellis eventually found her way to Mercer, and discovered her love for working with children. About a year ago, she founded Emiijas Hope, a not-for-profit organization in Trenton that serves the needs of 13 to 18-year-old teens in the prevention of violence, HIV/AIDS, STDs, and pregnancy.